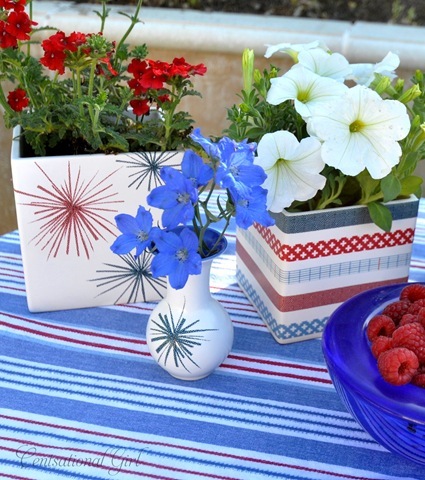 Fireworks Vases + Happy Fourth! I have a confession to make, I am crazy about Japanese washi tape. So much potential for cuteness in one little roll, I am smitten! I was browsing Etsy a month ago and stumbled across Pretty Tape. It was then that my love affair with this charming crafting tool began. I ordered a few rolls with plans to use them on birthday or holiday gifts. 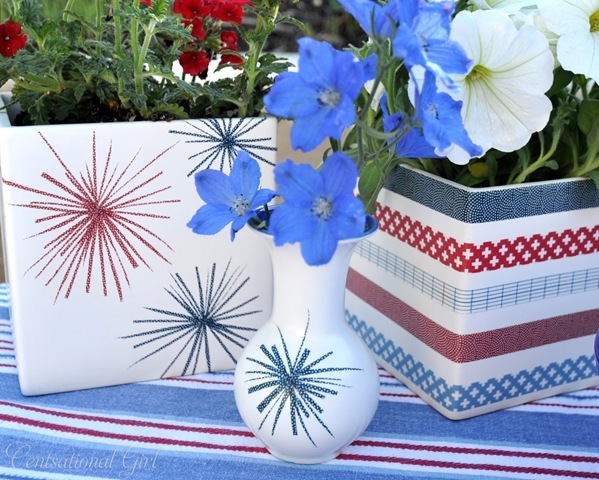 With the washi tape and some white ceramics, I also made some fun fireworks vases for the Fourth of July. I bought several of these square white vases from Crate + Barrel earlier this summer, and this Toni blue bud vase too. I love the modern shape and versatile appeal of the square vases and they’re affordable ($10 for the large, $8 for the medium). 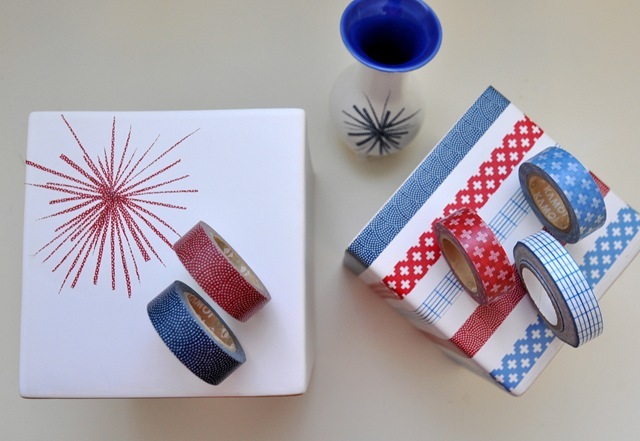 The “fireworks” are simply strips of the washi tape cut very thin and layered across in a random pattern to form the shape. The different tapes wrapped around this vase formed a fun striped pattern. Affixed to plain white paper, the tape dresses up this strawberry cake too. The washi tape pulls off easily, so replacing the blue stripes with more red in December will make perfect little vases at Christmastime. 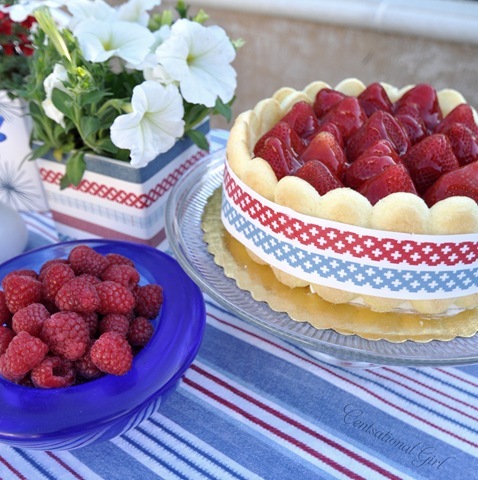 For today, they make a fun and festive Fourth of July centerpiece on the dessert table! Wishing you all a fantastic day of celebration. I haven’t used Washi Tape, yet, but love all the projects I’ve seen with it. Love your vases! They look so festive! Thanks for sharing. How smart Kate!! Your vases turned our beautifully. I will try the Washi Tape soon!! The square vases are my favorite! Come and join a very Fashionable Giveaway from the Shabby Apple! you are so creative – I love washi tape too!!! Ohhhh, that tape is awesome! Ahhhh…I want some of that tape! I pinned a green set. Thanks for a great find! Thanks Kate for sharing. Great idea; simple, quick and not pricey to do. I like it! Happy 4th!! Birlliant and so cute!! Happy 4th to you!! never heard of it, but love the tip! I’ll be on the lookout. So many crafty uses, so much fun! I love how your vases turned out – especially the striped one. I’ve never heard of this tape, but I am quite intrigued. Happy 4th to you & your family! These are STUNNING Kate! What a GREAT idea!! Happy 4th!! =) Have a great day!! Hmm…Never heard of this tape. I must look into it. Love it! Have a Happy 4th! Shame on you….now I have another thing to add to all my other “stashes”…..and my ribbon box is already overflowing. Really cute ideas…can’t wait to get some of this take. GIRL- You really are Centsational! What a great idea! I have been using Washi Tape to make drink flags for my wedding, you’ve given me some great ideas on how to use the leftovers! Thanks for expanding my decorating horizon!!! I must get some Washi Tape asap, Happy 4th Kate, to and your family. Thank you for sharing your wonderful talents!!!!!! You are so creative! What a joy your blog is! Those are SO great!! Love em! 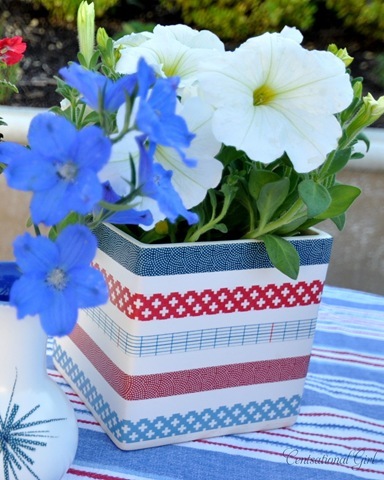 I love Washi tape and this was such a creative way to use it! My husband introduced me to washi tape. He spent the first 18 years of his life living in Japan. I love this tape! Great to have an Etsy source for it now. Thanks, Kate. Your vases and strawberry cake look so fun and festive! Hope you had a Happy 4th! These are awesome! 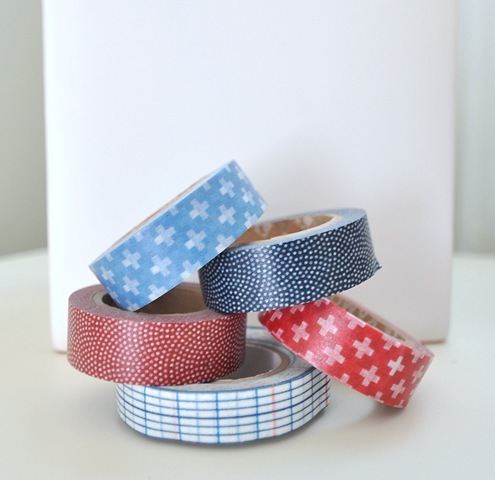 One question…where do you get Washi tape? I have yet to buy any because I don’t know where to get it. Love it around the strawberry cake – so fun and festive! Cute idea and can be used for any occasion with a ribbon swap out! Love it! What a cute idea! I’m glad you mentioned that it comes off easily! I’m excited to try some out for myself! My favorite place to buy washi tape is http://www.sugarbsupplies.etsy.com. They have a ton of awesome craft supplies! !